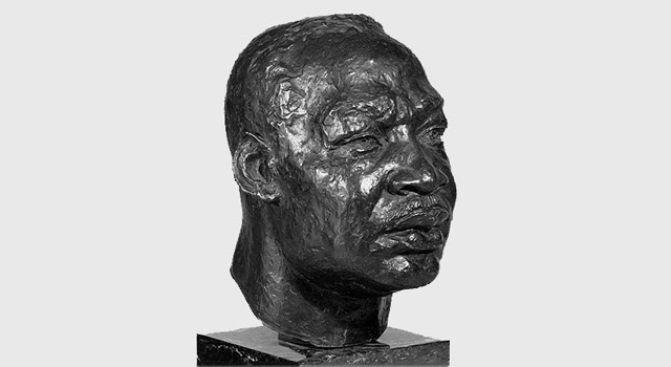 Sculptor Charles Alston created this MLK bust in 1970. It now sits in the Oval Office. Out goes Sir Winston Churchill. In comes Martin Luther King Jr.
An historic moment took place at the White House last month when President Barack Obama quietly added a bust of MLK to the Oval Office. It marked the first time an image of an African-American was displayed in the president's work quarters. The bust already made history in 2000 when it became the first image of an African-American in a public space in the White House, according to ABC News' Jake Tapper. The Smithsonian lent the bust to the Clinton Administration so it could be displayed in the White House Library. The MLK bust was added to the Oval Office to replace one of Churchill, who was on loan from the British Embassy after the Sept. 11 attacks, Tapper reported. The bust was returned before Obama's inauguration. The King bust is adjacent to a bust of President Abraham Lincoln, Tapper reported.